Hawai’i is a big part of the American dream. When this dream comes true, it’s everything you’ve been hoping for, and more. I planned our summer getaway to make my diver husband happy, and to let myself enjoy the not-so-active part of our vacation. I really needed to relax and get away from any stresses, even good ones. Two nights on O’ahu doesn’t sound like much, but that depends of what you make of it. Our stay at the Sheraton Princess Kaiulani was pleasant and care-free. The beautifully appointed resort is located smack in the middle of the Honolulu main drag and steps away from the Waikiki beach. Tropical cocktails around the pool, nightly entertainment, and clean airy rooms overlooking the palm trees teaming with birds were everything we needed for a quiet retreat. On our first evening, my husband and I walked to the historic Royal Hawai’ian Resort that looks like a rosy dream, or rather, like the Pink Palace of the Pacific. Besides being the ultimate upscale hotel on Waikiki, that hosted royals and presidents since its opening almost a century ago, this Spanish-Moorish style property, recently renovated to sparkling splendor, is home to a new restaurant, Azure, headed by the Hawai’ian-born and French-educated executive chef, Jon Matsubara. Seated on the open air terrace overlooking the ocean, we felt like royalty. The sea breeze, the warmth of the setting sun, the plush candlelit ambience and excellent wine and food – everything was perfect. Azure serves the freshest seafood from the daily Honolulu fish auction, and we had more than one chance to try it with our tasting menu. Signature sashimi included Hawai’ian yellowfin ahi and hamachi, garnished with avocado and radish salad, soy-ginger vinaigrette, and wonton crisp. “Ocean Cappuccino” in a coffee cup contained Dungeness crab and Black Tiger shrimp bouillabaisse with good chunks of seafood and dairy froth on top. 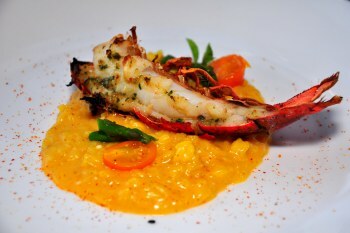 Kona lobster tail risotto was redolent of saffron, served with Waialua asparagus and locally-grown tomatoes, and paired with sweet German Riesling. For dessert, we enjoyed Kula strawberries from Maui with balsamic and cinnamon drizzle over ice cream. Next morning, conscious of those sweet extra calories consumed the night before, we headed for Hans Hedemann Surf School, a few short blocks away from our hotel. 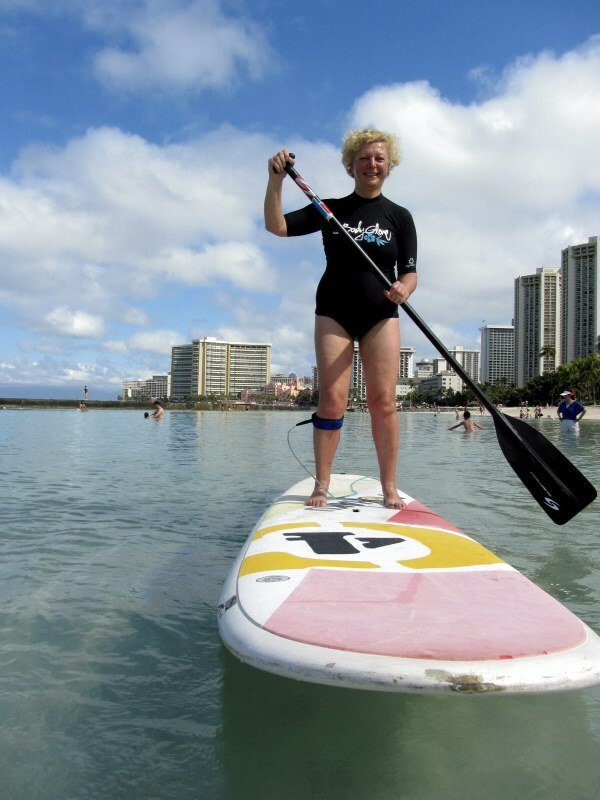 While my husband enjoyed a vigorous surfing lesson with a skilled instructor, I attempted an ancient and graceful water sport, known as stand-up paddle boarding. In the process, I learned two things about myself: that my toes can curl and thrust the board just like cat’s claws to maintain the balance, and – that I can maintain my balance on the board gently swayed in opposite directions by the ocean currents. After this calorie-reducing exercise and some frolicking in the silky blue waters of Waikiki, exhausted but excited, we made a reservation at the landmark Honolulu restaurant, Chef Mavro, named after the famed French-born chef/owner, George Mavrothalassitis. 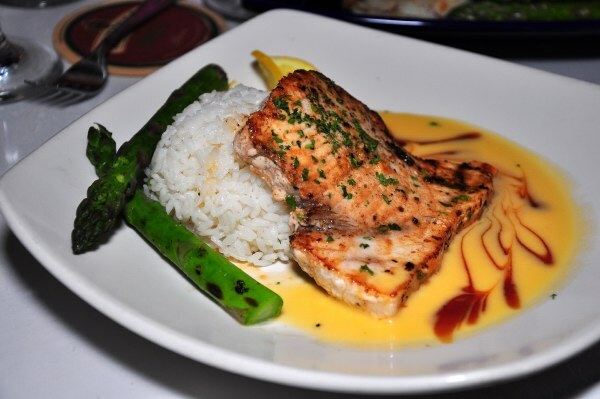 Chef Mavro’s gastronomic creations and wine pairings are true masterpieces in balance and subtlety, thoroughly appreciated by the local elite and visiting dignitaries alike. I won’t soon forget those meaty Kaua’I shrimp nestled in the bright orange sea urchin froth, and paired with the delicate Ginsuika sake. Day boat catch brought in a tender ono filet crusted with mochi, and garnished with asparagus spears in green veloute. Botani, dry muscatel from Malaga, complimented it nicely. 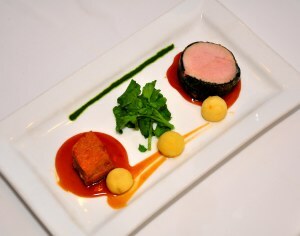 Kurobuta pork two ways came with vanilla glazed Molokai sweet potatoes and Sumida farm watercress, paired with delightfully full-bodied Andis Grenache from Amador County, California. When it seemed I couldn’t be impressed any more, our knowledgeable server brought along a delicate cube of champagne gelee with watermelon balls inside, and sweet Italian malvira to make it complete. Our one full day on O’ahu proved to be rather eventful and definitely joyous. Next morning, before heading for the airport to continue our vacation on the Big Island, we met with a Honolulu friend, who took us to breakfast across the street from our hotel, to the Moana Surfrider, a Westin Resort & Spa. 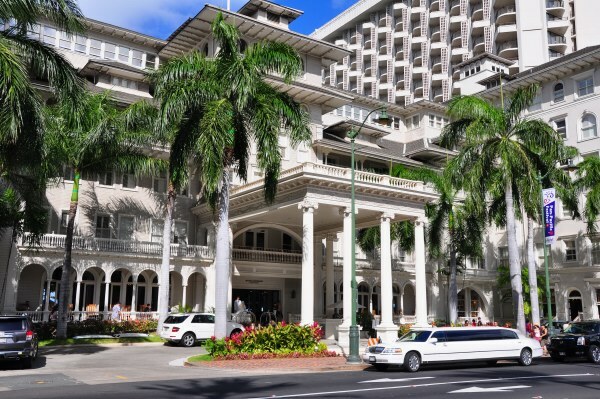 This grandiose white-walled hotel – Waikiki’s first resort – was designed by the architect Oliver Traphagen in the old colonial style, and opened in 1901, signifying the birth of Hawai’ian tourism industry. Today, its open air restaurant, The Veranda, is very popular for its delicious breakfast selections, from salmon eggs Benedict to powder sugar-dusted Belgian waffles with fresh berries. The Big Island (or Hawai’i) is so big, even a million and a half tourists that visit annually, cannot overwhelm it. There is always a place where you can be alone or almost alone, enjoying its vastness and the unbelievable diversity of its landscape and climate. The sunny side of the Big Island is called Kona, and we stayed at the Royal Kona Resort in Kailua-Kona village. Among the biggest attractions of this resort are the stunning sunset views from the Polynesian-themed restaurant, Don The Beachcomber headed by the Executive Chef Ken Omiya. We shared a sampler platter of Hawai’ian seafood delights, like Kona crab cake, Tsunami prawns, and seared peppered ahi, and then had some more fish from Don’s Line Caught Catch of the Day menu. It was hebi – shortbill spearfish with succulent tender flesh. Strawberry cheesecake for dessert, topped with whipped cream and fresh berries, and tropical cocktails made with rum and fruit juices seemed especially sweet against the backdrop of the setting sun. Next morning, bright and early, we signed up for a tour with Dolphin Discoveries, a local company that provides boating and snorkeling excursions around the island. We were there to see Hawai’ian spinner dolphins who populate these waters in large amounts and often like to spend time and even play with us, mere humans. Did I see any dolphins? No. My husband did, the majority of the passengers on our boat did, but I and a couple of far-from-the-Olympic-level swimmers did not. Every time our captain shouted, “There they are! Jump!” we tried to put on our masks and snorkels really fast, but were always late even to spot a dolphin’s tale. In the water, looking at the brilliant sunrays penetrating the endless blue of the Pacific around me I thought that it was also beautiful, but – no dolphin. 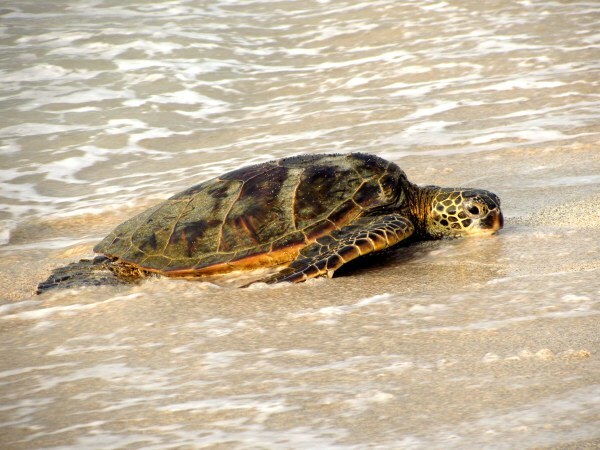 On Kona, I preferred to spend time with my kindred spirits – sea turtles. Exhausted by their daily activities, and coming from the ocean to the sandy shore to rest, these creatures climb up only as far as necessary, and begin enjoying themselves the moment they embrace dry land with their fins. Calm, serene, satisfied with life – isn’t it something we all are trying to achieve – at least while on vacation.